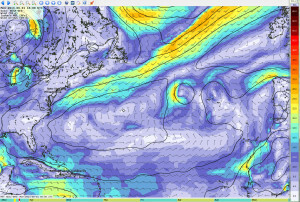 Chart #2 shows the GFS forecast for the North Atlantic at 01SEP1800Z — the start time of the race. 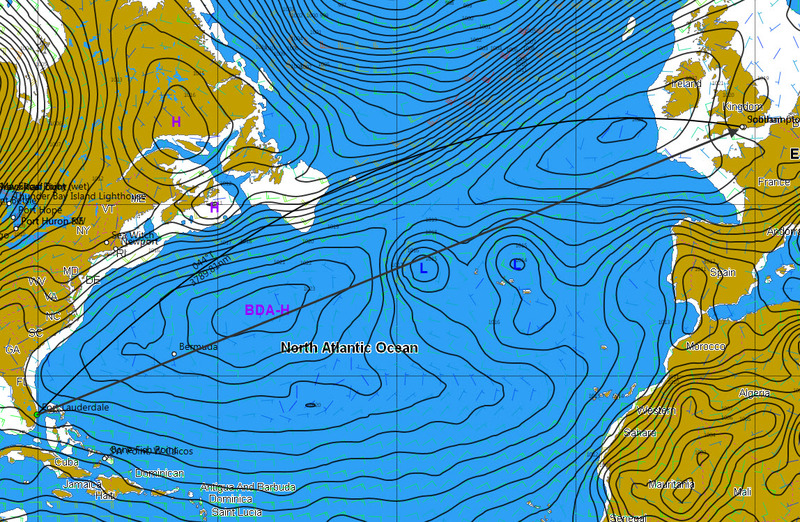 The Bermuda High (BDA-H) is blocking the route along the rhumb line. Going through the High is not recommended. There is no wind in there. Going south of it isn’t much better. The wind is on the nose. That leaves going north between the High and the North American coastline. I figure most skippers will be headed that way when the starting gun goes off. 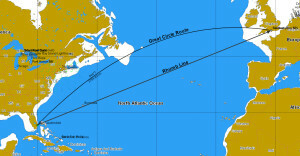 Following the Great Circle Route is a viable strategy. The initial bearing for the Great Circle route is 44°T. Based on current wind forecasts, however, I expect to point javakeda to left of that bearing. 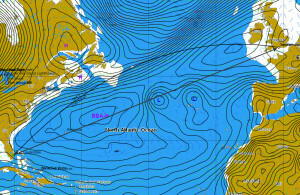 The third reason to go north is the Gulf Stream. Even though SOL does not adjust for current during a race, the GS is important because it makes its own weather. Look for more on that in a future post. The lines on Chart #2 are isobars — representing points of equal atmospheric pressure. The numbers in black quantify the pressure in “millibars.” To my eye, it is easier to see the weather patterns when MSLP isobars are displayed on the chart. The pressure values are part of the same GFS model that supply our wind forecasts in SOL. I download and display that information through my routing software. But you don’t need routing software for either the download or the display of the GFS forecasts. Chart #3 – Start time weather forecast as seen by the ZyGrib viewer. ZyGrib is an excellent, and free, GRIB file viewer — one that I learned about in chat from a top SOL skipper (outlaw, as I recall).